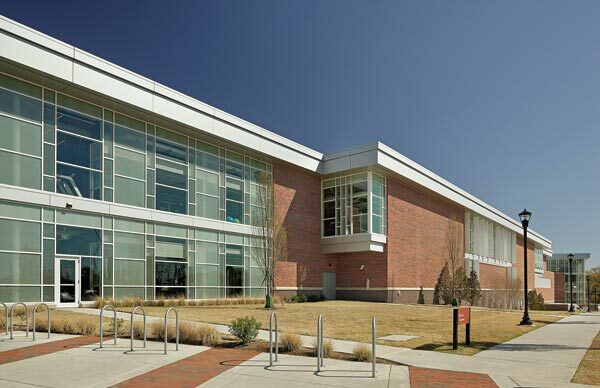 The University of North Carolina at Greensboro’s Leonard J. Kaplan Center for Wellness successfully integrates brick with precast stone elements, wood, metal panels, an aluminum-framed storefront and curtain wall systems for an industrial feel. UNCG Facilities Design & Construction, Greensboro, N.C.
Skanska, Rentenbach (a joint venture), Durham, N.C.
General Shale, Johnson City, Tenn.
At 216,000 square feet and spanning nearly an entire city block, the University of North Carolina at Greensboro’s (UNCG’s) Leonard J. Kaplan Center for Wellness more than doubles the size of the university’s previous recreation building. 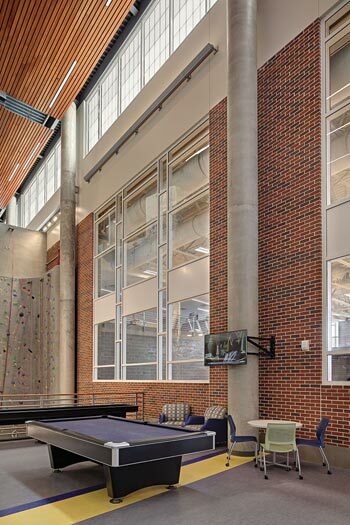 The facility was designed to provide indoor recreational space for a projected population of 24,000 students, along with faculty, staff and alumni. Completed in August 2016, the Kaplan Center includes multi-purpose gyms, an indoor track, a 23,000-square-foot weight and cardio space, lap and leisure pools, basketball and racquetball courts, group fitness studios, a roof-deck fitness studio, a cycling room, a 54-foot climbing wall, and numerous other spaces. The facility promotes campus health and well-being, as well as state-of-the-art instruction and research. Additionally, the center’s construction serves an integral role in UNC Greensboro’s plan to create a large, mixed-use development of residential, retail and student services. The Kaplan Center, which anchors the southern edge of the campus, incorporates modern construction materials and techniques, while utilizing a consistent palette of colors and materials that complement the historic fabric of the campus. A substantial amount of the exterior brick was also brought inside the facility as accents. Filled with natural light, the Kaplan Center is the antithesis of the old, dark, cramped rec center. 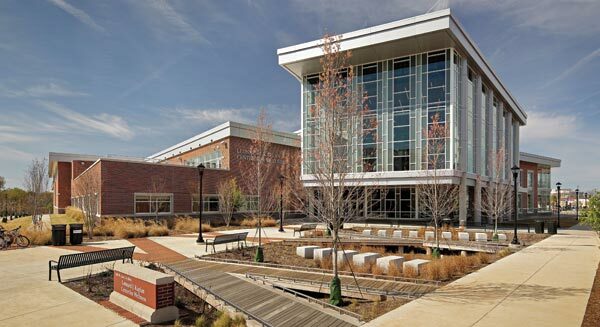 The successful integration of brick with precast stone elements, wood, metal panels, an aluminum-framed storefront and curtain wall systems gives the facility an industrial feel. The buildings on UNCG’s campus are primarily brick with limestone or pre-cast accents. The design of the Kaplan Center utilizes a similar palette, coordinating with, but not exactly matching, its surroundings, allowing the new building to stand out. 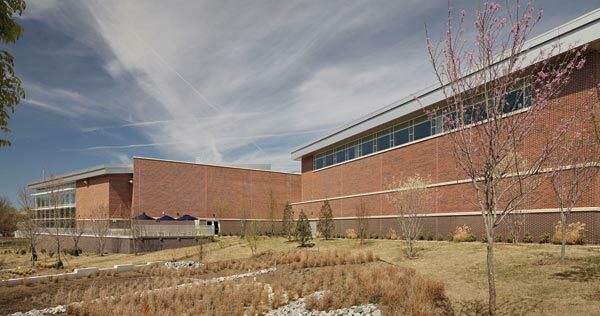 General Shale’s Davidson Blend brick was used for the project, with Red Velour for the face brick and the darker Chestnut Velour for the accent color at the base of the building. The Davidson Blend has also been incorporated into additional campus projects. With the building situated on a sloping site, the architects designed varying elevations to change planes both vertically and horizontally. The massing and layout were dictated by the large gyms, pools and exercise rooms inside, along with outdoor terraces and an exterior fitness studio. Ceilings were raised high in the interior open spaces to maintain a light and airy feel. The design of the 216,000-square-foot, state-of-the-art facility incorporates varying elevations to change planes both vertically and horizontally along the sloping site. Two years of research and planning went into the design of the Kaplan Center, followed by two-and-a-half years of construction. The project’s primary goals were to create an easy-to-use and maintain, durable, highly securable facility on a growing campus located alongside a neighborhood in transition. Given the high foot traffic experienced in a recreational facility, hard surfaces were a priority. While burnished CMUs, ceramic and glass tile, terrazzo flooring, and wood were utilized on the interior space, a substantial amount of the exterior brick was also brought inside as accents. Circulation was another key design issue, and the facility is spacious, open and easy to move through. While the $91 million Kaplan Center is a sleek, modern, state-of-the-art facility, it still fits well into the historical context of the campus, which is located in the middle of a state where brick is held very dear. According to the architect, “This is brick country. People are traditional about using face brick. They like the look of individual brick and the flexibility it affords for changing directions and creating planes.” As a result, the Kaplan Center projects strength, vibrancy and community — the very attributes the university seeks to impart to its fast-growing student population. To learn more about the Kaplan Center, visit recwell.uncg.edu/kaplan-center. Dawn Henning has served as General Shale’s director of marketing since 2011. Headquartered in Johnson City, Tenn., General Shale is the North American subsidiary of Wienerberger AG and a leading manufacturer of brick. For more information, visit www.generalshale.com. 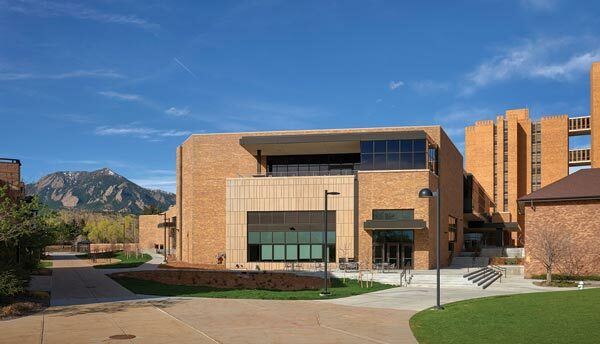 General Shale brick was also used in the construction of the University of Colorado Boulder’s Village Center. Find out more at www.masonrydesignmagazine.com. Although it may have taken three decades to complete – courtesy of construction delays and political wrangling – the British Library at St. Pancras (BL) is recognized and appreciated now for its sheer size and brick detailing. Built between 1962 and 1997, the BL is the second-largest library in the world – more than 1.2 million square feet of space with more than 25 million books – and one of the largest public buildings in Europe. 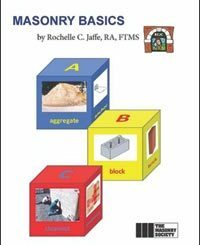 Rochelle C. Jaffe recently completed the second edition of the popular Masonry Basics, which is now available through The Masonry Society (TMS). This excellent primer, which serves as an introduction to masonry design and construction, is economically priced at just $35 ($26.25 for TMS Members). Masonry component materials, the ways in which they are assembled to form the masonry construction, and the weather-resistance and structural implications of the various types of masonry assemblies are described.